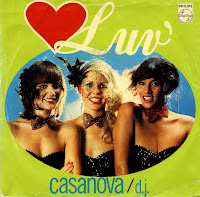 'Casanova' was Luv's fifth hit single, released in April 1979. First awarded the 'Alarmschijf', Radio Veronica's weekly tip for the chart, the single quickly moved up to sixth place in the Dutch Top 40. Nothing else is very spectacular about the song: it sounds a lot like the trio's earlier material. I bought the single back when I was just an eight year old. I was a fan of Boney M, Abba and Luv', and having learned the importance of a record collection at a very early age from my older brother and sister, I bought anything they released. The least you can say about Luv' nowadays is that their records had great sleeves back then.